Yesterday I made a slight error. It’s something I’ve done before, when I strangely only allocated myself 2 hours to drive from Heathrow Airport to Stoke. I did it again, but this time I was driving back from Reading. I knew I wouldn’t get back in time. I’d already come out of my hotel room a bit late, but then there was some issues with the checkout process and I ended up on the motorway far later than I wanted. So, my traditional “fix” would be … to floor it. However, that fix isn’t really possible now. We can’t sit in the outside lane at 95mph any more. We’ve lost the hard shoulder because of “all lane running” and there’s average speed cameras keeping everyone at around 70-75mph. It’s easy to see why self-driving cars are appealing on our long, straight motorways. It’s almost dull now. Everyone doing pretty much the same speed, much like some US highways. There I was then, going as quickly as I dared without triggering those little yellow cameras mounted on the gantries. I had Google Maps telling me the best route back. I tend to use it even if I know how to get back because, especially on the longer journeys, it can spot upcoming traffic problems and route around. However, Google Maps will do something else – it’ll give you an ETA. I knew it was going to be tight and I wouldn’t be back for a meeting, but I was stuck against the invisible force field of the average speed cameras. Then I hit a patch of roadworks. Well, I say a “patch”. This wasn’t a patch. It was part of the “smart motorways” work that seems to be happening on nearly motorway I travel on right now. The speed limit was reduced down to 50mph due to the thinner lanes, cones and workers. I figured I was going to totally miss my meeting, but no – Google Maps updated the ETA as I slowed down and it wasn’t too far off the original time. It happened again a bit later when I got stuck behind a wide-load that was hogging two lanes of the motorway but, surprisingly I was only going to lose a couple of minutes from my journey time. That just seemed a bit nuts, but it made me relax a bit. I’d lost an average of 20mph but I wasn’t losing a great deal of time off my ETA. I can’t remember exactly, but it was only a couple of minutes difference. So, by that evidence, it was clear than trying to mash the pedal and roaring along at 90mph wouldn’t have won me much either. In years gone by, in my head, flying up the motorway at over 90 would definitely get me there far quicker. In reality though, it doesn’t. So, that got me thinking, is Google Maps making me drive more sensibly? Well yes. Yes, actually, I think it is. 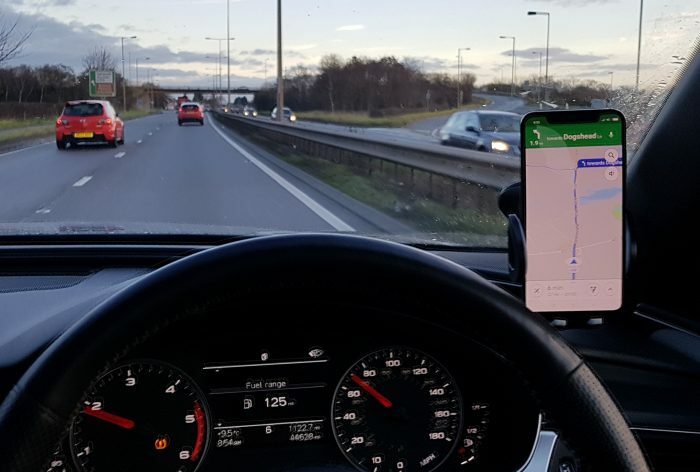 The post Is Google Maps making us drive more sensibly? is original content from Coolsmartphone. If you see it on another news website, please let us know.